This book (a novel? A novella?) is really the story of a coming-of-age of an adult woman in Louisiana who is struggling with becoming an independent person while being married to a wealthy man she doesn’t particularly love. A young male acquaintance named Robert is the catalyst for her realization of the possibility that she could be happy and independent, but how to do that, in this world of strict etiquette and gender expectations? I had been thinking (from an earlier reading) that this edition of Chopin’s work was an early Feminist work (published in 1899). However, then, on further delving, it was pointed out that very few people read “The Awakening” when it first came out as it was not a commercial success and it received some pretty awful reviews so it wasn’t republished. Her other short stories were published and even anthologized, but “The Awakening” didn’t really receive much positive attention until 1969 when a volume of her work was republished and regained attention. And this is rather a shame, as this is a good read with some great descriptions of Bayou coastal life and life in the South. 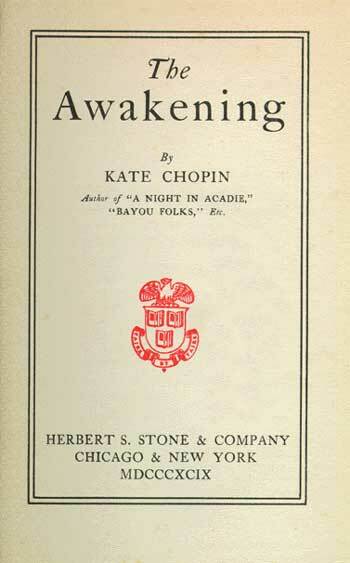 On reflection, Chopin’s The Awakening’s critical rejection could also have been due to the misogyny of the time – most of the media reviewers were men (at that time), and as her leading character was a frustrated married woman who refused to accept the limitations of the woman’s role and instead chose an alternative way (thus completely rejecting societal mores), it might not be that surprising that the male reviewers did not embrace this radical viewpoint. So, yes, it’s a Feminist work but it’s been quite widely argued that it wasn’t written to bring attention to the issue of feminism, emancipation or any other cause. Chopin was not involved in any Feminist or other causes (according to researchers) and it’s argued that Chopin was just writing the world as she saw it as an artist and writer and not trying to change the world. She wasn’t using it as a tool to further women’s suffrage, even accidentally. I don’t know. It’s tough to read something that was written at the end of the nineteenth century without looking at it with the perspective of a twenty-first century reader. How can you really ever take that pair of glasses off because your (own) experience of life has to influence how you interpret things, especially works as nebulous as art? Perhaps Chopin was really just writing this to make a buck and there wasn’t any extra meaning to this whole thing. This entry was posted in Uncategorized and tagged American, classic, coming-of-age, domestic, gender roles, women by lizipaulk. Bookmark the permalink. I read “The Awakening” getting on for 30 years ago, and I read it as a feminist book – my edition was published by The Women’s Press and it was certainly regarded as being feminist in my circles. Our perceptions of books are bound to be coloured by the circumstances in which we read them, and the prevailing view of things. Whether Chopin intended it to be simply individualist or promoting the independence of women is difficult to say now, but it doesn’t stop us putting our own feminist interpretation onto the book. After all, that’s part of the joy of being a reader – we can get things out of a text that the author never intended! I absolutely agree with you on this. Good point, Kaggsy!